AYP: Any wild Crazy Ivan stories from your Oi Boy days in JAPW? PETE: Not too many crazy stories about Ivan from JAPW, I do remember doing a promo with Matt Striker where we were thumb wrestling in it. Really funny stuff. The first legend I ever worked with was during that time and it was Ivan against the Missing Link. I saw Link and Ox Baker get into a shouting match outside before the show. That was pretty surreal. Years later I was fortunate to team with Ivan on a regular basis as The Repeat Offenders in promotions from CT down to NC and everywhere in between. AYP: You’ve done some acting, including appearances in The Wrestler and Nurse Jackie. Since professional wrestling contains an element of acting (promos, character portrayal), why do you think so many wrestlers do not translate so well on the big screen (Hulk Hogan, John Cena, etc.)? PETE: Acting and wrestling are two very different worlds. Wrestling works off of realism and changes the emotions of the fans based off of what the wrestler wants, where as when something is 100% scripted, someone else tells you what emotion you’re trying to envoke before you even understand the script. It’s like taking two different paths around an island. You’ll eventually hope to get to the same destination, but how you get there will be vastly different. AYP: You are currently the reigning heavyweight champion in the UPWA. How long have you held the title, and who have been some of your biggest challenges? PETE: June 3, 2014 marked my 500th day as UPWA Heavyweight champion. My biggest challenge to date has been against a monster named Sinister. I’ve never felt my career or title threatened as much as I did when I was in the ring with him. He beat me so bad with a kendo stick I didn’t think I was gonna make it through the night. Another time the top rope snapped while I was wrestling with him and instead of ending the match he started choking me with the broken rope. AYP: Ulrich Von Vorse has been a thorn in your side. It all comes to a head on July 4. Any predictions of what will happen in the match? PETE: Ulrich Von Vorse being a thorn in my side is an understatement. He’s been like a great white shark stalking prey. Very calculating and strikes quick and hard. I’ve been back in NJ healing up my knee after what he and his cronies did to me at UPWA’s event on May 31st. I will get my revenge on July 4th in Southport, NC. I told him I’d agree to any of his stipulations and he countered with a German Nobleman Match. I believe it’s anything goes until someone can’t answer the 10 count. AYP: Are you currently active with any other promotions? PETE: I currently work for PPW in PA and occasionally ECPW in NJ. 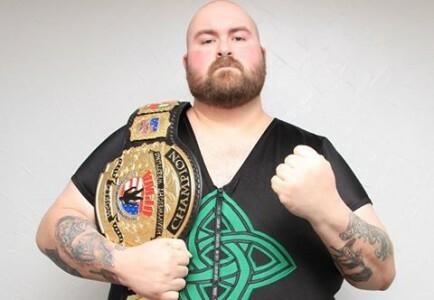 AYP: What’s next for Pete Nixon in the wrestling business? PETE: Probably not much more than I’m doing now. I walked away from wrestling twice a few years ago once cause I got burned out and the second time after my daughter passed away, and now I pick and choose where I want to work now. At one point I was wrestling so much I put 87,000 plus miles on a brand new car in a year. Wrestling has given me a lot in life, it led to an acting career, it led to friends that I consider family, and I even met my daughter’s mother at a show (before anyone yells rat, it was her first show and she got dragged to it by other friends HAHA). It’s provided me with many many things I would have never dreamed of and I will always be indebted to wrestling for them. I still have my first pair of boots sitting in my closet. AYP: What’s in your acting future? PETE: As long as the jobs keep coming in I will be there. If I could spend every day on set I would. AYP: If given an ultimatum, which career path would you choose? PETE: I would choose acting in a heartbeat. It pays better, for the most part it’s easier on the body, and I haven’t got burned out on it yet. AYP: Thank you for your time. Where can fans follow and track the career, past and present, of “Big Irish” Pete Nixon? PETE: It was my pleasure, thanks for digging into my past with the Oi Boy stuff, that was pretty cool. Fans can check out different sites for different parts of my career. The Big Irish Pete Nixon Fan page on Facebook, The Official Repeat Offenders at http://www.facebook.com/repeatoffendersnj and all the Oi Boy stuff at http://oiboyjr.8m.com.